NAR information specialists are happy to answer your questions. Email, call or live chat with us if you don't find an answer below. How can I locate my NRDS ID? You can find your NRDS ID here. How can I find my nar.realtor username and password? Learn how to retrieve your username, password or NRDS ID by watching this video. How do I change my address, email address, or office information? Once you are logged in, click the My Account link on the right side near the top of the www.nar.realtor home page and select Manage Account from the dropdown. 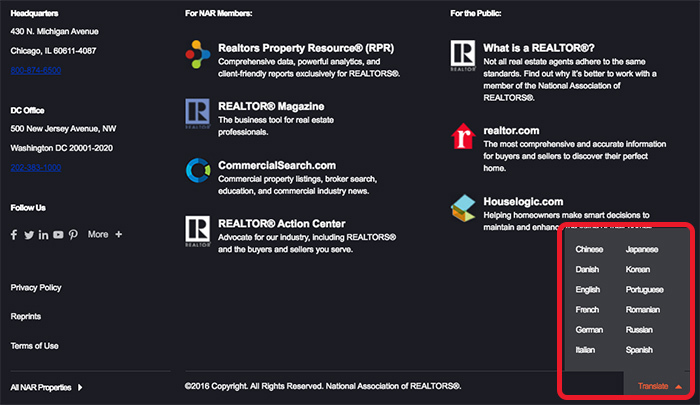 Next, click the Change your member data profile (NRDS) link under the Update Other NAR Accounts heading. When you click this link it will immediately display your own member record. The fields you are allowed to change, including your e-mail address, will be visible on the screen (fields for which you do not have access must be updated through your local association). Once you have updated your information click the Save Changes button to save your changes. Where do I pay my dues? What programs and products do REALTORS® have a discount with? Please see all REALTOR Benefits® Program Partners. How do I print a copy of my membership card? Please visit NAR’s Member Center site to print a free card or purchase a plastic card. Where can I take the Code of Ethics course? Please find the courses for New Members and Existing Members here. How do I join the National Association of REALTORS®? You must first join a local board/association of REALTORS®. Please see our How to Join page for details and a link to a directory of local boards/associations. How do I reach realtor.com®? You can reach realtor.com® at (800) 878-4166 or at customercare@realtor.com. How do I translate nar.realtor site pages into my native language? To select your preferred language, scroll to the bottom of any page on nar.realtor. Click on the "Translate" link — you’ll find it in the lower right hand corner on your desktop or laptop, and at the bottom of your mobile screen. Read the full instructions on how to translate our site into several different languages. Note: To use web chat, disable your browser pop-up blockers.